What about the eighth king of Revelation and the feet of iron and clay? Home/Mailbag/What about the eighth king of Revelation and the feet of iron and clay? QUESTION: If the stone strikes the image upon its feet and toes during the time of the end, where in the stream of time does that leave the eighth king of Rev. 17:11? Is it possible that these two events mentioning differing numbers of kings/rulers could years or even centuries apart? I do not understand why God made these two prophecies so confusingly different if they are to happen at close or similar time periods. And, do you ever foresee a time when any true Christians/JW’s might be placed in positions of worldly authority like Daniel was in Babylon and later Persia? ANSWER: The prophecies are amazingly harmonious and not confusingly different at all. Although Jehovah’s Witnesses are unaware of it, the problem is that the time of the end has not begun yet. And that means the prophecy of Daniel has not been unsealed. Up until a couple of years ago the Watchtower did not teach that the iron and the clay symbolized the Anglo-American dyad. A Watchtower published in 2000 reiterated what was stated in the Pay Attention to Daniel’s Prophecy commentary, saying that the iron and clay amalgam merely represented a politically fragmented world. However, they hit upon the key point that the iron symbolized empire and the clay represents independent nations. But then in 2012 the Watchtower came around to the notion that the iron and the clay specifically represent the Anglo-American duo, which, for whatever it is worth, is what I put forward back in 2005 in Jehovah Himself Has Become King. But what is the significance of the entire image itself? The Watchtower places no importance on it. However, the point of the prophecy is to reveal how the kingdom stone will destroy all vestiges of human rulership. That would include the eighth king that springs from the seven, would it not? As regards the image in the second chapter of Daniel it is important to point out that two of the empires that make up the seven-headed beast of Revelation had already come and gone when Nebuchadnezzar came to power. In fact, Babylon overthrew Assyria and Egypt. So, that is why the prophecies of Daniel do not concern themselves with the seven —only the five counting from Babylon. But, again, what about the eighth king? Not only that, but the ten horns of the seven-headed beast are said to give their power to the scarlet-colored beast. In other words, the last king derives his power from the consent of all the kings, but primarily from the Anglo-American kingdom. The ten horns find a parallel in the ten toes of the iron and clay feet. The entire image obviously stands upon the feet and toes, which harmonizes with the fact that the Anglo-American duo have been and will be in the future, the primary promoters and supporters of the United Nations. For that reason the stone strikes the feet, thus toppling the entire image. 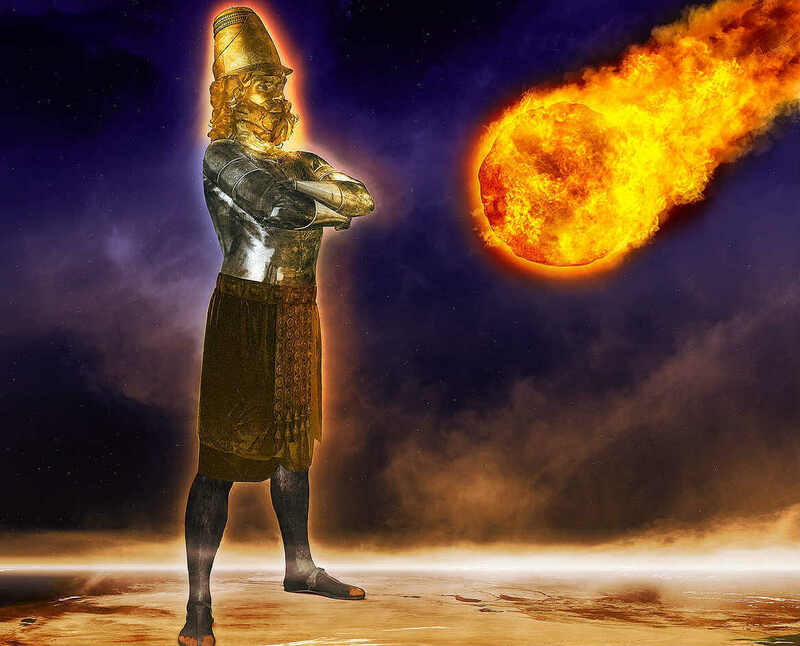 It is interesting that Nebuchadnezzar is the head of gold on the image. That the entire image with its head of gold represents the last kingdom also harmonizes with the numerous prophecies that depict Babylon as the last kingdom. For example, the prophecy of Habakkuk and the 13th and 14th chapters of Isaiah describe Babylon as the destroyer of the world who is then destroyed by God. As for the second question, the answer is no. True Christians will never be part of the political system. If they become such they renounce their faith. The reason God elevated Joseph, Daniel and Esther was to demonstrate his power to do so and accomplish his purpose. But, since the time of Christ, or more accurately —since that Pentecost 33 C.E., God’s Kingdom has gone into operation. And considering that the series of prophecies in Daniel all relate to the coming to power of the Kingdom and the holy ones, the elevation of Daniel to a prominent position in both the Babylonian and Persian administrations demonstrates the point that ultimately God is in control, and as Nebuchadnezzar learned, God can bring down the high and mighty and raise up the lowly. This is what will take place when the holy ones of the supreme One are given the Kingdom and together with Christ smash the nations, crushing them out of existence.